Five (5) Americans and two (2) Peruvians killed on a Chinook BH-234 helicopter crash in Peru's Amazon jungle. The 7 people are employees of Petrominerales Ltd, a Canadian-based oil exploration firm, according to local media report. According to Peruvian official report, the 5 U.S. citizens and 2 Peruvians were on the helicopter, and that rescue crews were recovering their bodies. Local media reports that the witnesses saw the chopper lost control and bring up smoke before crashing. 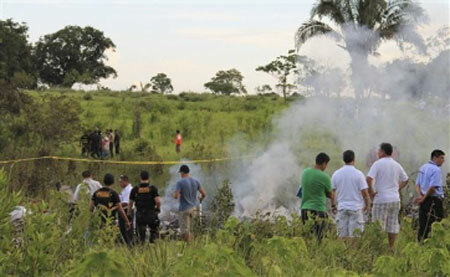 Police commander, Miguel Cardoso said, the "three bodies were recovered Monday and three more on Tuesday, from inside the chopper's charred wreckage," then added, "they have different trauma. It appears they jumped out of the helicopter out of desperation, because they have multiple fractures." The 5 Americans were identified and they are, Dann Immel, Edwin Cordova, Jaime Pickett, Darrel Birkes, and Leon Bradford. While the 2 Peruvians were identified as co-pilot Igor Castillo and mechanic Luis Ramos. Meanwhile, Columbia Helicopters has been in business for 55 years, mostly they contracted to companies, like Talisman, engaged in oil and gas exploration. Comments or suggestions about "5 Americans died on Chopper Crash in Peru" is important to us, you may share it by using the comment box below.